Physical Description:  p., col. ill., 18 cm. A brother and sister wonder about the mysterious establishment in the next town called the Swinster Pharmacy. 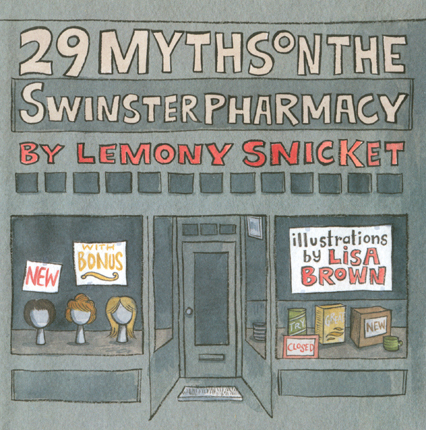 Booklist - 02/01/2014 This peculiar picture book collects 29 “myths” about a small-town pharmacy, delivered by a young pair of siblings (and their West Highland terrier) who are obsessed with this mysterious establishment. The “myths” themselves, a bemused selection of statements, questions, and wonderings, are by turns poetic (“When the town aches, the Swinster Pharmacy aches with it”) and pedestrian (“I think the Swinster Pharmacy is closed on weekends”). Brown paints the titular pharmacy a drab gray that permeates the rest of the story like a dense fog, and her children, dressed in yellow, orange, and red, stand out against the inky obscurity like the incisive investigators they are. The sum total of Snicket’s rambling curiosities and Brown’s attentive detail, indelibly charming and aggressively unique, will not be everyone’s cup of tea. But the small trim size, thoughtful design, and generally exceptional production values (the dust jacket unfolds to reveal a poster of the Swinster Pharmacy on one side and a map of the town on the other) make it an especially special package for the right reader.HIGH-DEMAND BACKSTORY: Although this is hardly mainstream Snicket, the latest from the best-selling author is always reason to take note. - Copyright 2014 Booklist. School Library Journal - 03/01/2014 Gr 4–8—Innovative in both its style and gloomy dénouement, this picture-book mystery unfolds as an episodic essay of 29 seemingly random observations. It employs both narrative and expository voices as it describes an old-timey downtown pharmacy with "Styrofoam heads wearing wigs" in the window and employees wearing long white coats.The Swinster Pharmacy remains unchanged in what is "usually a quiet town," and this timelessness presents a puzzle that two children investigate tirelessly as they are certain that there is something terribly wrong with this establishment. Careful observers will find clues in the illustrations that supply reasons for the seemingly gratuitous obsessiveness. The story is written in a droll, but authoritative voice reminiscent of pre-1960s journalese, and the art has a flat, understated style that is reminiscent of Marc Simont's work. The two friends are essentially reporters, and their reports read like poetic fragments: "15. The building is a perfect square./We measured it last night," "18. 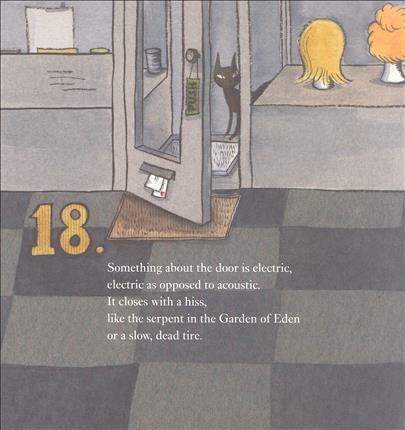 Something about the door is electric as opposed to acoustic./It closes like a hiss,/like the serpent in the Garden of Eden/or a slow, dead tire." This picture book is a wee bit odd in tone, it is true. Nevertheless, it could be used a springboard for readers to develop and solve the implicit whodunit story, or as an opportunity to analyze what constitutes solid evidence versus allusive facts.—Sara Lissa Paulson, The American Sign Language and English Lower School, New York City - Copyright 2014 Publishers Weekly, Library Journal and/or School Library Journal used with permission.